Perception is the next generation of Practice Management Systems. It will allow you to spend more time with your patients, and less time struggling with IT. No contracts - pay monthly - we believe the quality of our software will make you want to stay with us! Over the last 12 years we have developed what we believe is the ideal Practice Management System for independent opticians. From the very beginning we utilised internet technology to allow access from anywhere on the planet, and now also provide an automated backup system that backs up securely and automatically to The Cloud at pre-determined times, however your live database will be stored at your practice, not in The Cloud - contrary to what many who have jumped on the buzzword bandwagon will tell you - so that if your internet connection goes down, you can still trade! Perception requires just a regular PC or Mac, no expensive servers required. Just plug one or more computers in to your router and they can all access your data. We are able to migrate your existing electronic database to the Perception format for a nominal fee, and this will save you many hours of re-typing Px records. 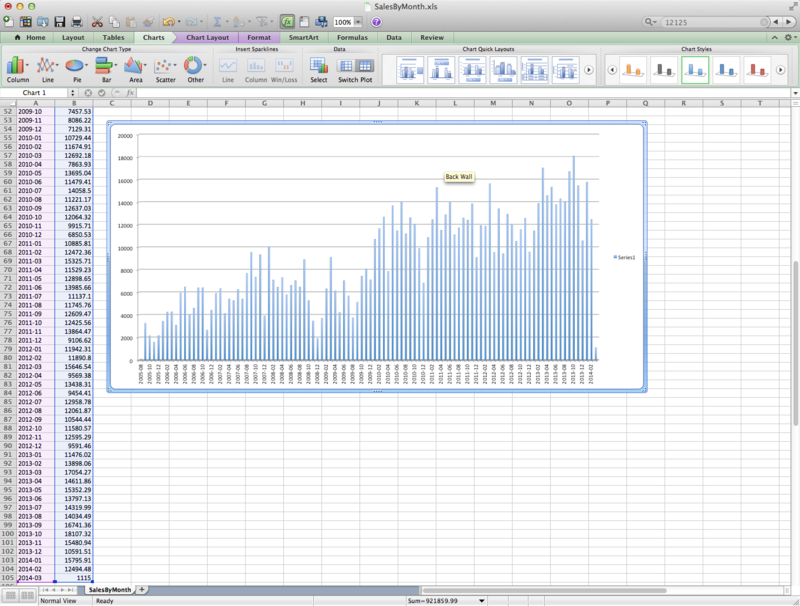 We have so far converted customers databases from Optix, Optisoft, See2020 and even Excel spreadsheets! Thus far there is no existing system we have not been able to migrate. 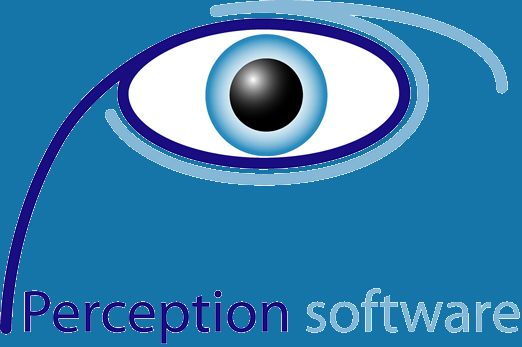 What´s new in Perception V3? 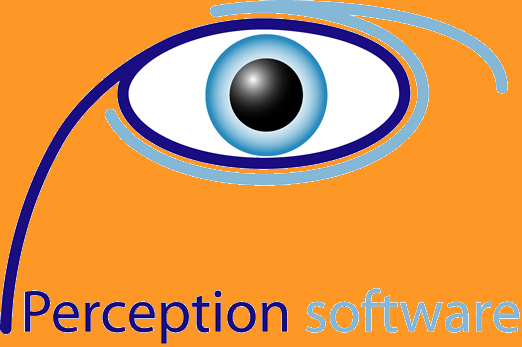 A major improvement in Perception V3 is the brand new Clinical module. We listened to many Optoms and designed our new clinical module so that it speeds the Patient's journey through the eye test. To that end, we have included as many fields as possible in one display, but kept it uncluttered at the same time. We also give you a button to click so you can mark all fields as 'healthy' with one click. Perception can also give you the up to the minute information that you need to run your Practice effectively and efficiently. Do you know what is your best selling frame? How many Patients you saw last year compared with this year so far? Do you know how your turnover compares with previous years? Do you know when your best month is? Do you know which gender and age range spends most at your practice? These questions and more are all answered easily with the Perception Business Dashboard. The dispense module is now much improved, and alongside our new clinical feature is ideal for the paper-less practice. You can record full details about a dispense and send the information to the till ready to receive payment from the Patient. You can then print the dispense details as a workshop order, and to accompany the spectacles until the Patient collects them. An oft-requested feature. This feature is so new it only made it into V3 at the last minute. It will be expanded over the coming months. Currently it allows you to export all sales totals by month to Excel, and also to export all transaction details to Excel (or a compatible system). It is difficult for a computerised diary to be as flexible as paper and pencil. However, we think we have come pretty close. We have made the diary look like a real diary. Everybody knows how a diary is supposed to work! 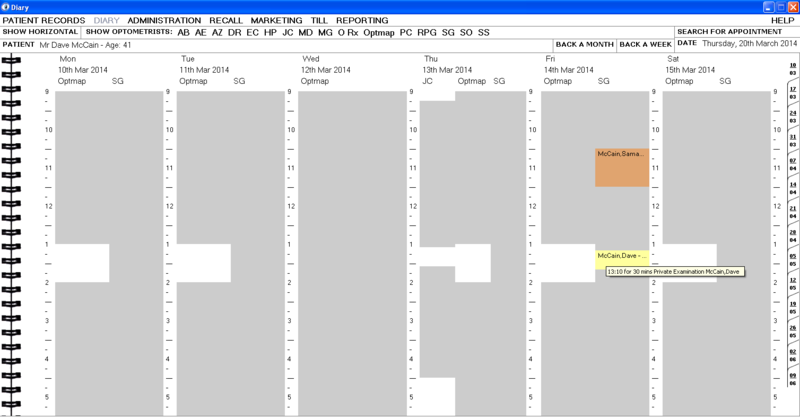 You can view the diary by day or by week, and can view all optom diaries on one clear page, or just one optom's diary. There is no scrolling required. You can select the week or day to view with the tabs on the right, and can go back a week or a month with one click. Appointments are colour coded to help interpret the day. Appointments can be limited, for example no more than 4 children's appointments in a day. When an appointment is made, that patient's recall letter is suppressed. You can send an SMS text message to all Patients with an appointment on a particular day with just a few clicks. This greatly reduces 'no shows' and helps improve your profits. The diary will prompt you if an NHS appointment is booked too early. You can search for free appointments. 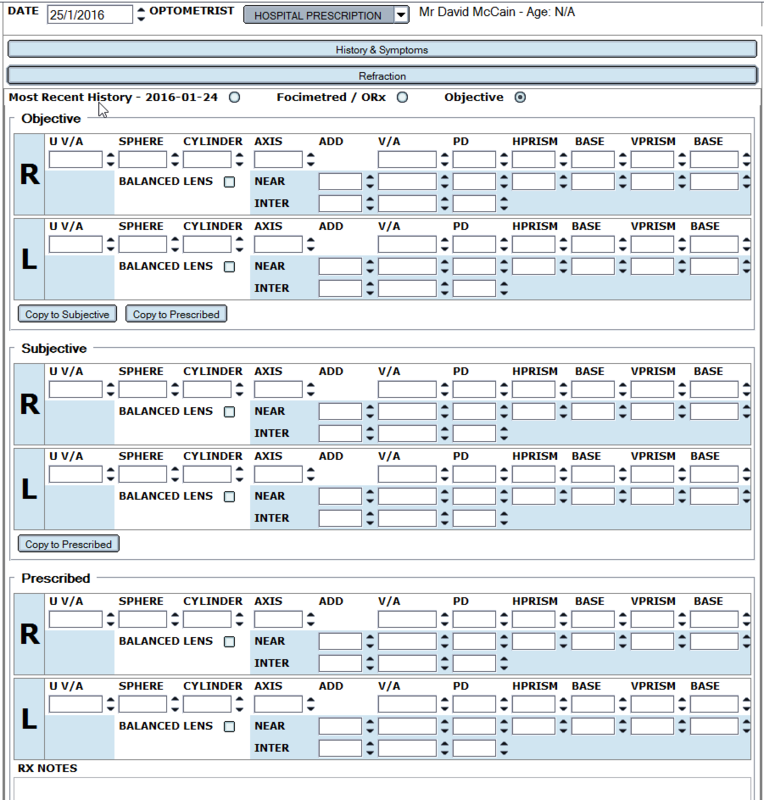 Patient Records has the look and feel of a familiar card index file. Automatic postcode addressing. Why type an address when Perception will complete it for you? Full patient details, Personal and contact details, Prescription and Contact Lens details and Dispensing History. Send letters, emails or text messages directly from the patient record card (contents are stored for future reference). Appointment/contact history. 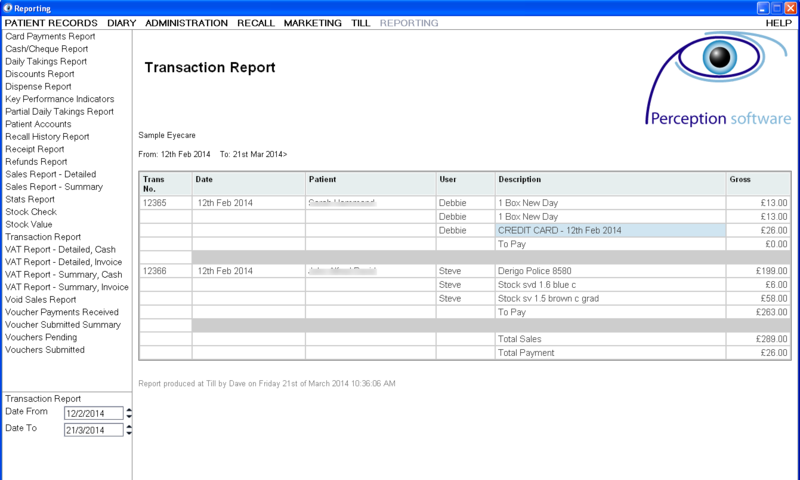 Used in conjunction with our Diary, you can move and cancel a patient's appointment from their record card. Patient account balance and transaction history. We are very proud of our new Clinical module! Our clinical module is the major new feature of Perception V3. 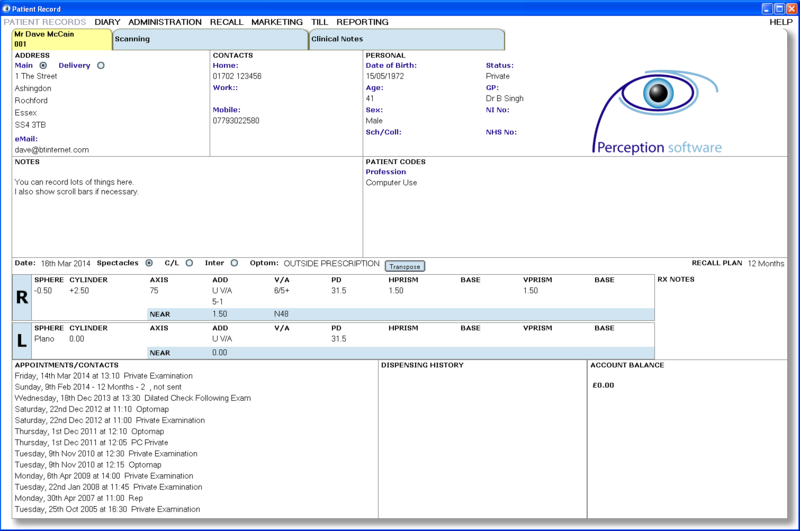 It allows the optom to record every detail of an eye test. It includes time saving features such as a button to mark all 'External Eye/Ophthalmoscopy' settings as healthy with just one click. The single display is scrollable, and only features drop-downs where absolutely necessary. 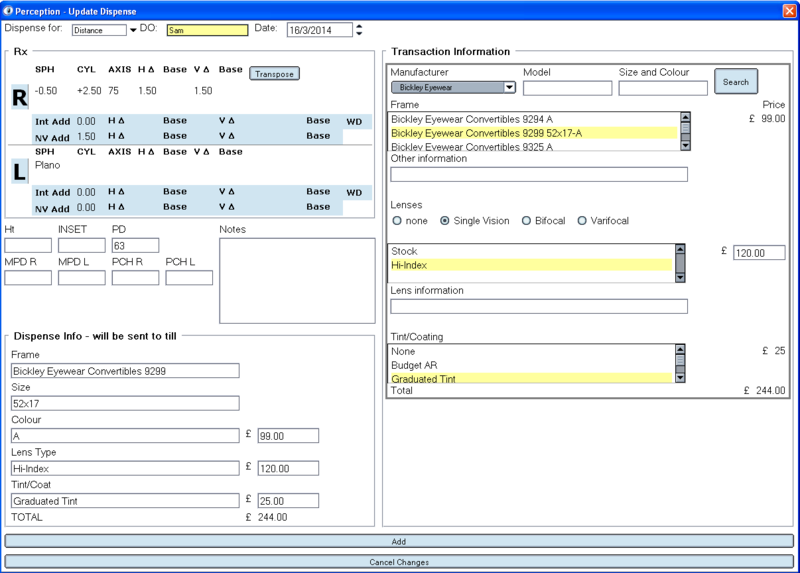 Further time saving features are included such as copying the results of the focimetered/outside Rx to Objective, and then copying details from Objective to Subjective, and then to Prescribed in order to save time. All the data is saved, and is available to view in the history display. Perception has a full featured till and epos facility. The Perception Till supports receipt printing and bar-code scanners. It has a full screen with large buttons, and supports touch screens. 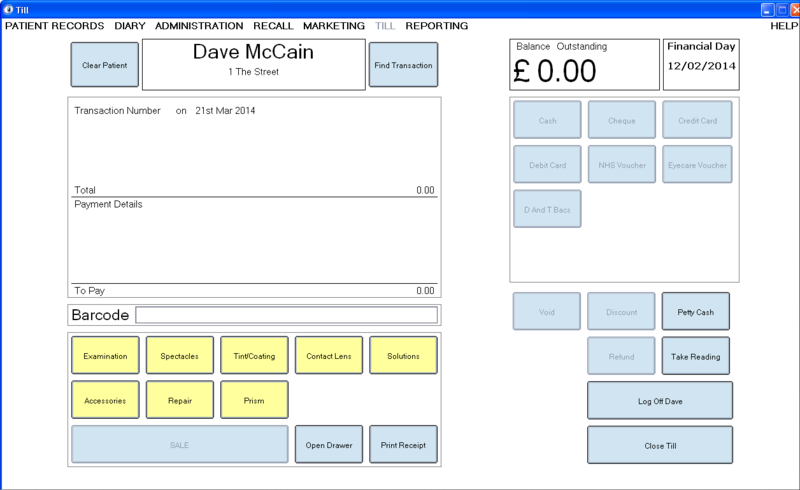 It supports full reporting, from X and Z readings to VAT and Sales reports. There is also full patient account tracking, and patient account balance and full sales history is available from the Patient Record Card. Perception has full User Permissions, configurable in the Administration section, to keep control of discounts and refunds. There is automatic stock control, with auto stock reduction and multiple VAT methodologies are supported. Access to Stock Control functions is secured with User Permissions. Perception constantly monitors the reminder status of each patient making sure that each is scheduled for regular examinations. While many software systems provide only one or two reminders, Perception can send an infinite number. No falling through the cracks. Once a patient in in the system, they will always have a reminder date so you can be sure that your patients will be notified when they are due. Recall is the lifeblood of your practice. Ineffective recall can cost you thousands of pounds in lost business. With a superior recall system like Perception, you can rest easy knowing that your patients ocular health and your business is in safe hands. Perception is a flexible reminder system. As well as sending out reminders by letter, you can take advantage of email and SMS text messaging. You can even combine different methods, so send the first reminder by email, but subsequent reminders by letter. Using the integrated Word Processor you will be creating appealing and professional reminder letters in no time at all. If that isn't enough, with Perception you can even include a marketing attachment to selected reminders. Combining marketing with reminders helps you to reduce costs. Have you considered the alternatives to reminder letters, eReminders. More and more households now have access to the internet. Even more use email at work. Why not utilise technology to reduce costs by sending reminders by email. Create an attractive page with just a few mouse clicks, include colour and pictures with links to your own website or email address. You can even send a follow-up reminder by letter. Given that most people now have a mobile phone, doesn't it make sense to use the latest technologies to contact your patients? Using Perception you can send your reminders by text directly to the patient, for only 3.7p per message. Using the latest technologies is cheaper, and reminders can be received by the patient much more quickly. Marketing can target the right Patients at the right time. Marketing is an essential component of the modern practice. Using Perception you can add marketing information to your reminder letters (or emails or texts), thus reducing costs at the same time as increasing customer loyalty. 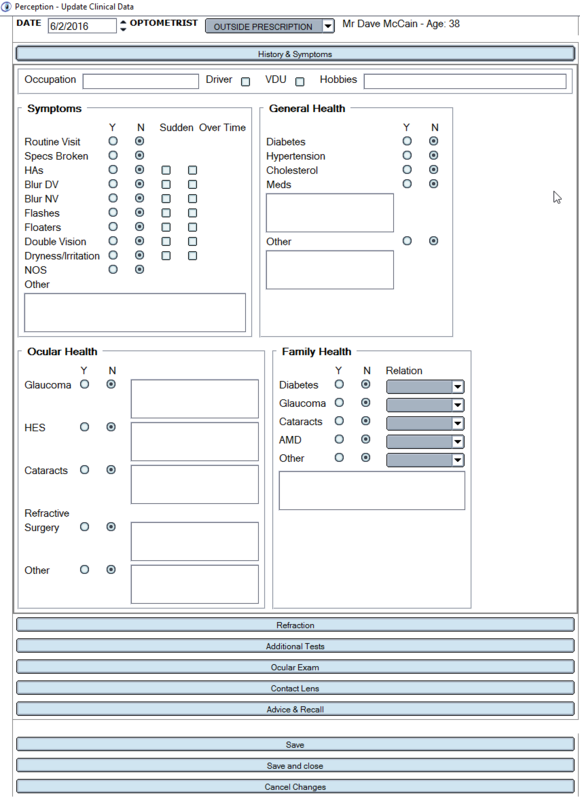 Using the integrated word processor, you can format marketing information to enhance it's impact, and easily include fields from patient records. You can target patients who spend over a certain amount or who have an interest in sunglasses for example, and send them an email or text message. Simply define your required patient codes, and activate them against specific patients. Then you can target them at any time. Sending reminders by email, you can create graphically rich communications using colour and images. You could even include an option for them to reply to you, requesting that you telephone them to arrange an appointment. 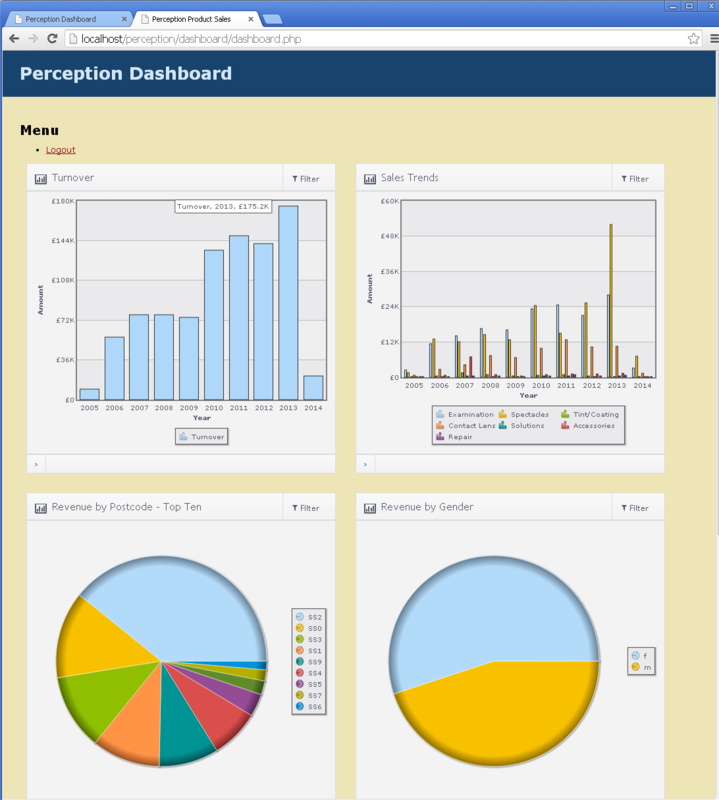 Perception has a full reporting suite available. All required reports are there, and we are also able to create custom reports for a small fee, or at no charge if the report would be useful for all Perception users. This is a brand new feature in Perception V3, and we are hoping to expand it over the next few months. Currently as delivered, the dashboard provides a drill-down snapshot of your turnover, Sales trends, Revenue by Postcode, Revenue by Gender, YTD Target display, Patients seen this year compared with last year, and Top Sellers. © Copyright 2004 - 2017 Perception Software | All Rights Reserved.